Are there any groups in Christian circles that take the part about "lifting holy hands" as an admonition or command for how to pray, and therefore practice this regularly? If so, do they also make a distinction between men and women doing so (by the fact that the first part of the verse may be seen as being addressed directly to the men)? And finally, is it known whether lifting hands during prayer was just a common tradition at the time Paul wrote to Timothy, in which case the emphasis might not have been on the "lifting hands" part, but more on the "holy...without anger or quarreling" part? Many Christian groups practice this. It's quite common. So much so, that it's considered ordinary among many groups. It's especially common in Charismatic groups, but it's also found in more conservative groups such as Baptists. To classic Pentecostals lifting the hands in praise and prayer is second nature, flowing from a tradition decades old. But to the new convert or non-Pentecostal just entering the Charismatic movement, the custom may be new and awkward. Most traditional Protestants have only seen the minister lift his hands to give the benediction or blessing upon the people. Questions follow: Why lift hands to worship and pray? What does this practice mean? As we explore the twenty-eight verses in the Bible on this subject we will find answers to these questions. Lifted hands must not mask sin. Worship offered to God while still practicing iniquity is an abomination (cf. Ps 40:6-8; 50:7-23; 51:16-19; Is 1:11-18). Defiled lives must be cleansed by repentance: "When you spread forth your hands, I will hide my eyes from you; even though you make many prayers, I will not listen; your hands are full of blood. Wash yourselves; make yourselves clean ...." (Isaiah 1:15-16; cf. 59:1-3). R*ather we are to lift up "holy hands without anger or quarreling" (1 Timothy 2:8). * The prophet Jeremiah admonishes the Israelites mourning the destruction of Jerusalem, "Let us search and try our ways, and turn again to the Lord! Let us lift up our hearts with our hands to God in the heavens" (Lamentations 3:40-41, KJV). A typical search on a major search engine will list thousands of results for anyone wishing to learn more. which means the same thing, but certainly reads differently and might have a different connotation. In the Catholic tradition, the hands of a priest are venerated and considered holy as it is his hands who consecrate the bread and wine which become the Body and Blood of Christ. At ordination, a priest's hands are anointed with oil. 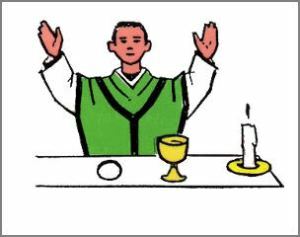 The priest also lifts his hands when he prays the Lord's Prayer at mass. And in some congregations, the people for some strange reason follow along, maybe their hands are holy too? Not the answer you're looking for? Browse other questions tagged prayer tradition or ask your own question. What is the “path” of a prayer? Do any Protestant denominations practice meditative or contemplative prayer? Is there any record of a visual method of prayer in the Bible? Did the Christian practice of having a prayer before Bible study evolve during Martin Luther's time?